We have judged brisket around the country and have found that most teams (and we assume the backyard chefs) really suffer when it come time for the brisket to be judged. Most cooks have few clues as to how to prepare brisket that is both tender and flavorful while at the same time not overly smoked, bitter and tough. There are many "crutches' people use in preparing brisket. We will attempt to help you avoid these crutches, to really barbecue brisket and have something to rave about and wonder why you didn't win the category! To demonstrate effective barbecuing of the brisket, we are going to spend some time showing you how and what to look for in selecting a brisket, how to begin preparing the brisket as well as cooking and proper slicing to achieve optimum results needed to serve competition quality brisket. In each of the topics we will be visiting, (selection, preparation, etc.) we will explain how the contestants move through the process of creating award winning entries for the judges to select from. There are thumbnail photos, which when "clicked" will display the full sized photo. 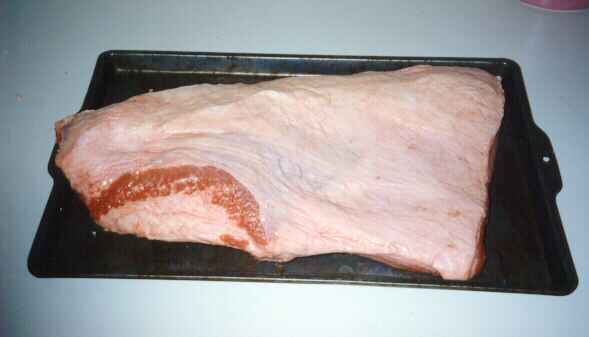 The brisket might very well be the most difficult piece of meat there is to barbecue. It is naturally tough, contains two separate, distinct muscles separated by a layer of fat that does not render. 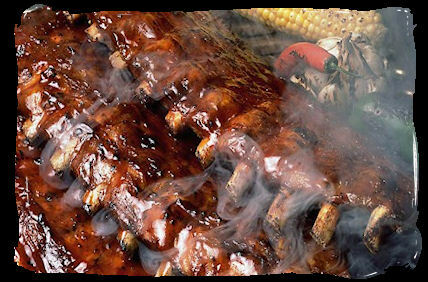 The meat absorbs smoke like a sponge, can become bitter very easily and is so large as to require longer periods of cooking times. There are many competition teams that admit they do not have a clue as to how to "cook those dern things". Well, we would like to eliminate some of the mystique surrounding this cut of beef and hopefully speed everyone to a better barbecuing experience with the brisket ... at least to make the judges job more difficult! Selecting the best brisket is a combination of skill and luck. 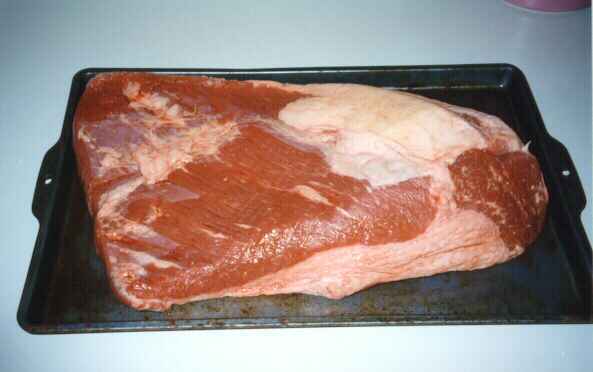 As you may be aware, the brisket comes from the front (chest) of the cow, between and in front of the animal's front legs. This cut of meat is most used for walking and is thus naturally tough. As such, it requires some careful determination in selecting the best cut for judging/eating.